New Year's Eve in the guest house. 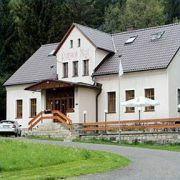 The guesthouse in the PLA Jizera Mountains in Bedřichov near Jablonec nad Nisou. It offers 8 rooms, each with its … More » own bathroom. The rooms are double, triple and quadruple with the possibility of extra beds. There is also a family room with a baby cot.